How many beds will you need to fit in the home? 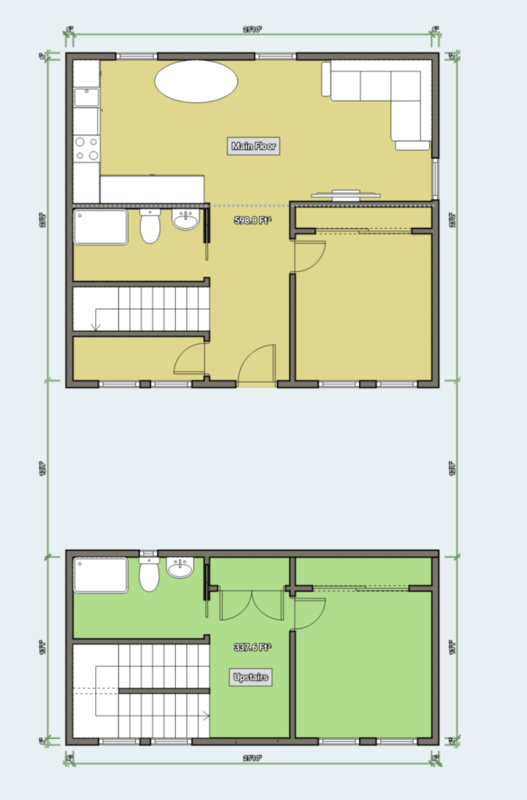 Will a loft be sufficient for additional sleeping? Will more than 1 person be using the bathroom at once? How much cooking will you be doing? Do you need a gas stove? Will you need space for a washer & dryer? How much room for entertainment? Since the space is smaller in a tiny home, you will need to consider all of these items and anticipate your need and use of limited space. Lack of storage is usually a stess-maker down the road so plan accordingly. Adding a loft, closets or additional cabinets can help alleviate this. 2 bedroom 1 bath tiny home. This site-built home is 552 square feet main floor, and up to 200 square feet of loft space. Perfect if you want a little house, but with a little more breathing room! This small home is perfect for those that may have guests, and don't mind if they stay upstairs. The loft is nearly 350 sq' which means you have room to sleep another 4-6 people, or an entertainment area, or tons of storage. You choose! It has a large 16x8 porch to enjoy the outdoors, in a addition to a large master bedroom and a full bath. The kitchen is large with a bar so you don't have to buy a table. Great home for a small family that is on a budget. 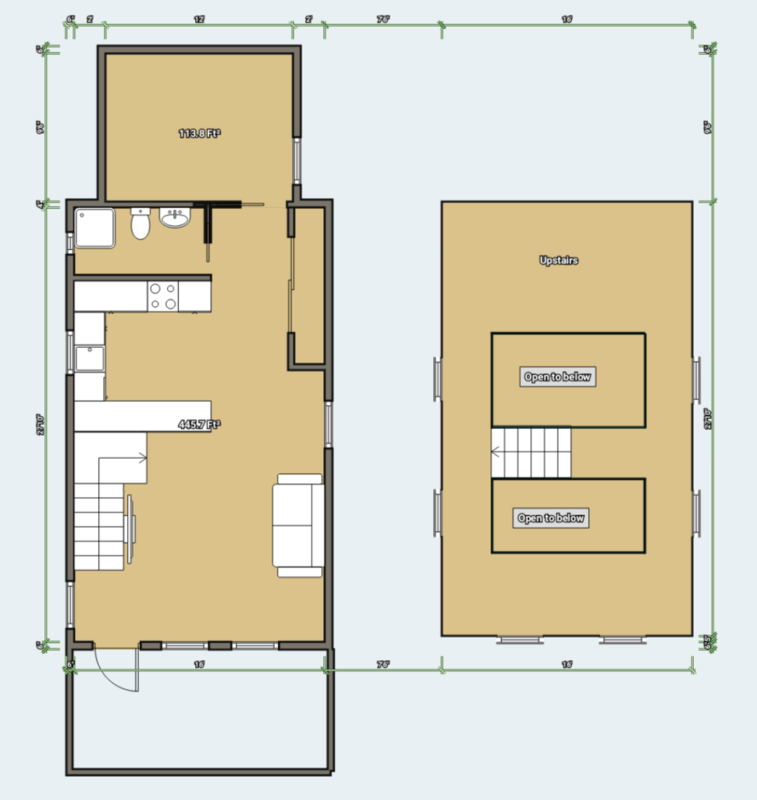 This efficient 237 sq' floor-plan is perfect for the person that wants a small space, but with important amenities and comfort. It is extremely affordable to build and has the potential to be a country, craftsman or victorian style with a high pitched roof with plenty of windows. 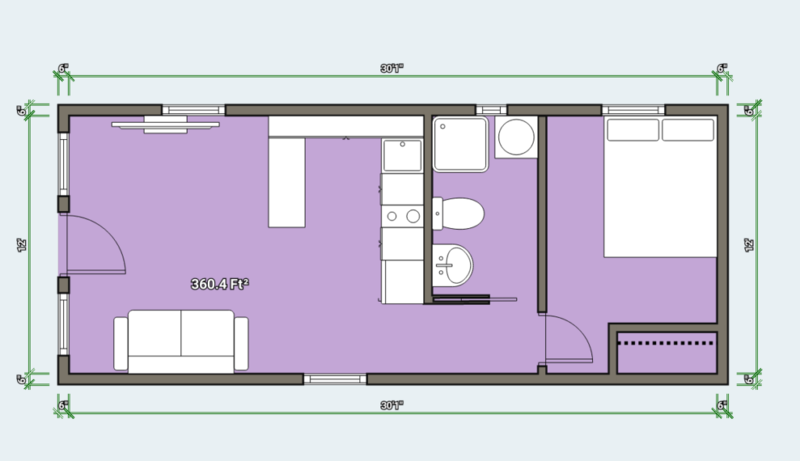 This 332 sq' floor-plan is ideal for those that want plenty of space in the bedroom, kitchen and bathroom. 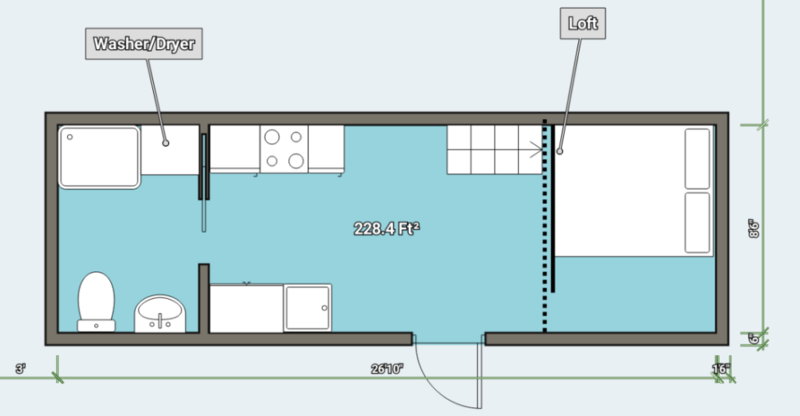 This floorplan was intended for a cabin or off-grid home but can work for anyone that is on a budget. Sometimes a loft can be a deal-maker with additional storage and/or sleeping space. This 254 sq' tiny home on wheels can sleep up to 4 with a large loft big enough for a queen bed. 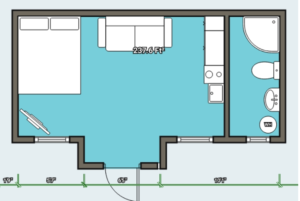 Includes space for a washer/dryer and even a little room for a TV. This home on wheels offers a queen bed, with a large loft above for even more space. 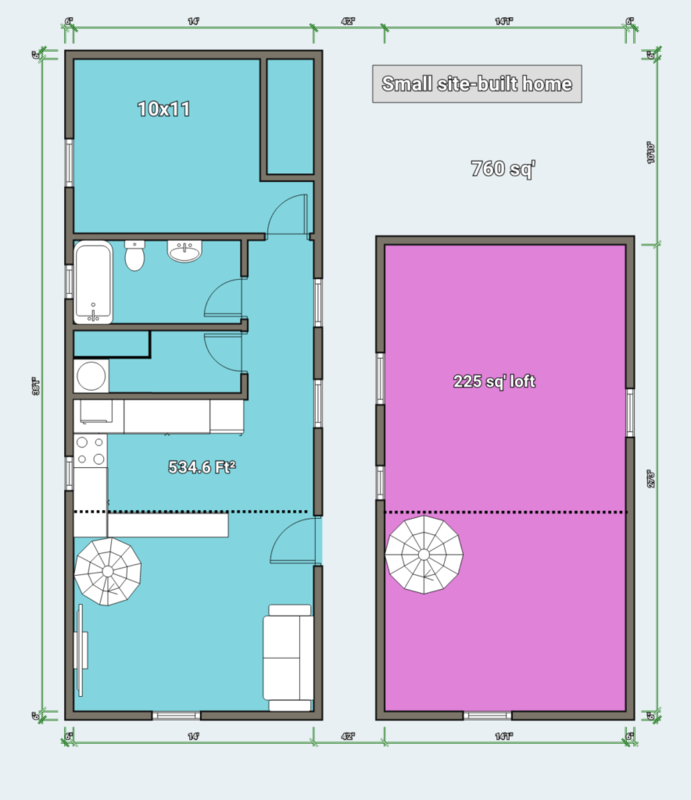 All inclusive tiny home floorplan with washer/dryer, stove and refrigerator. Because of the loft space that is above a large bed, it can acomodate a queen sized bed. This allows comfortable sleeping for up to 4. This is a unique small home with a main floor of 598 sq' and an upstairs of 337 sq' totaling 936 sq'. It is a 2 bedroom, 2 bath home with a large kitchen and family room. Ideal for a small family with the need for extra storage and room for entertainment. The outside can be country or colonial with stone veneer, brick, hardwood or even stucco. Add shutters for a more country effect and pop-outs for personality. 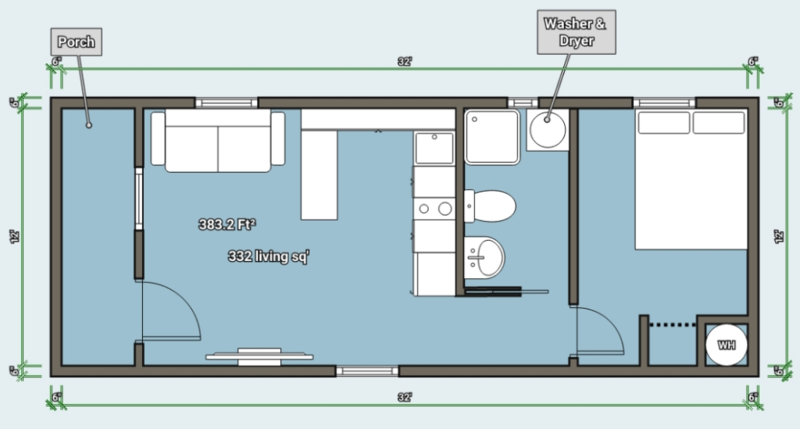 This is a unique floorplan of 360 sq' and can be used as a regular tiny home or cabin. 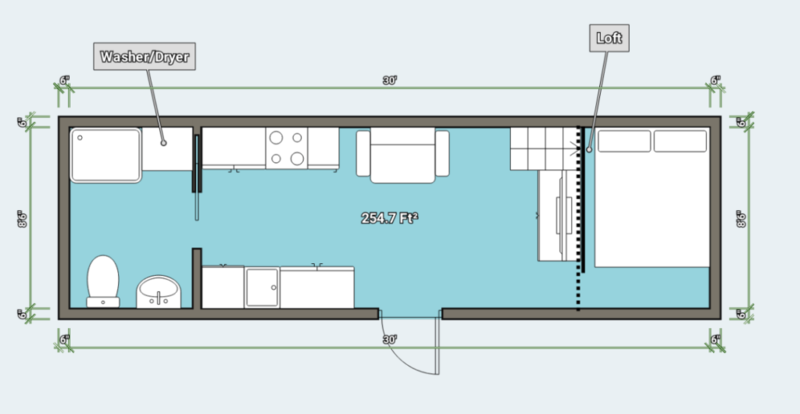 It is originally planned as a site-built home but can be modified for a home on wheels. The bathroom is larger than normal but allows space for a washer/dryer. The kitchen is large and has a long counter/bar that replaces a table. This is a unique small home with a main floor of 535 sq' and a huge loft of 225 square feet. The family room is large and is open to above. This is a 1 bed, 1 bath home. However, the lofts dimensions is 14x16 which can be a large family, room, bedroom, game room, storage or whatever you need. The loft is accessed by a beautiful spiral staircase. 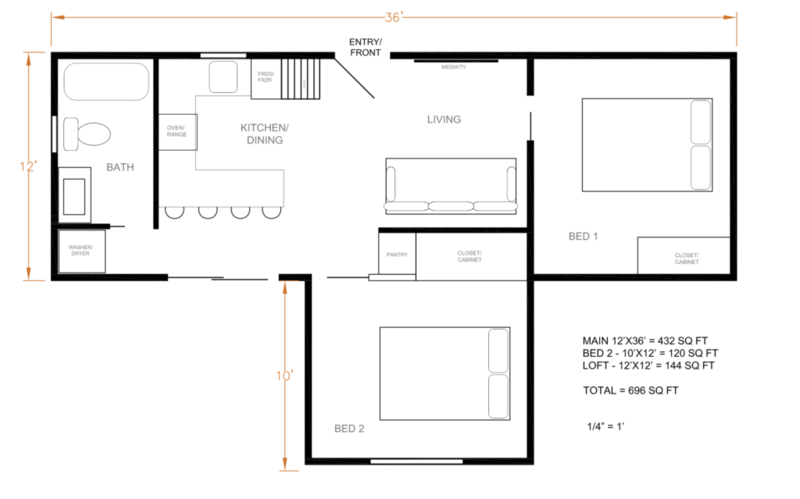 Not the typical collection of floorplans but nicely designed.